Perfectly rounded, bite-sized deliciousness, dipped in colorful frosted coating, and sprinkled for effect. Placed on a stick like a lollipop for a no-mess, classy bite of sweetness. Could anything be more decadent? More delectable? We didn't get them that day. I don't know why. Probably because I'm mean. I didn't feel like cleaning up the mess or they didn't need another snack before nap, I don't know. But they've never let me forget it. So this weekend when my husband popped into the coffee shop, asking what he could bring them back, cake pops were the obvious choice. When he entered, the girls were ecstatic. Finally. Finally! Finally, they would know the joy that is cake pops. Only not. Not at all. Eventually, weighted with curiosity, I gave them a try myself, and yech! No wonder the girls can't eat even this one small mouthful. The frosting is as if made of plastic. The cake within...is it even cake? I mean, are these supposed to be cooked at home or something? The doughy mess sticks to your teeth and your stomach lining. Tell me it's just my local Starbucks. 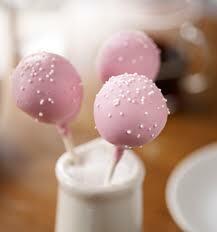 Restore my faith in the beauty of the cake pop. Because right now, I'm sorely disappointed. And for two dollars, too. Because God forbid the price match the size. My Teb has had cake pops from two places, The Rocky Mountain Chocolate Factory and a local pharmacy that makes their own treats. He's loved them both, so maybe it really is just Starbucks? He tried the chocolate on chocolate as well, if that helps.